It would be an exercise in understatement to say that Prime Minister Theresa May’s communications style is very different from President Donald Trump’s. One is boisterous, unscripted and unconventional. The other is calm, collected and a policy wonk. Trump gives tons of interviews to journalists and offers ample access to the media, albeit with a bias toward his favorite network — Fox News. May does what is required of a Prime Minister and rarely tweets, which is all managed by her communications team. However, you could describe them both as “Teflon” leaders. They’ve persevered and bounced back from political crises that would have crippled other leaders. 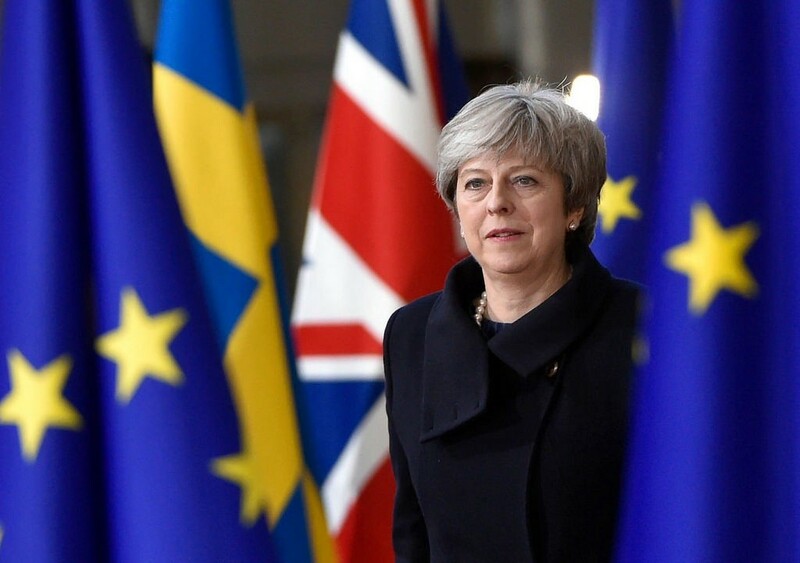 In January, May faced the largest defeat in the history of the House of Commons when its members resoundingly rejected her Brexit deal. She brought the deal back for a second vote earlier this month, only for it to lose again, this time by the fourth-largest margin in Parliamentary history. The whispering of a third Parliamentary vote was scrapped by Speaker John Bercow, who invoked a precedent from 1604 to prevent another doomed vote on May’s deal. Privately, many MPs consider this a favor to May, who would have likely lost the vote again. May has been playing a game of chicken with members of Parliament (MPs), pushing them to a March 29 deadline in hopes that the lack of support for a hard Brexit will lead to more support for her deal. With only nine days left until the deadline, it was all but inevitable that she would seek an extension at the European Council this week. The next few days will offer May another opportunity to take center stage, own her narrative and communicate clearly her vision for the direction of the country. Today, May stood at the dispatch box in the House of Commons for the weekly Prime Minister’s Questions to make the case that a short extension of three months is the best path forward. Thus she has set a new red line. Many are interpreting this as actually two red lines — one for the end of Brexit negotiations on withdrawal, and one for the ultimate fate of her political career. 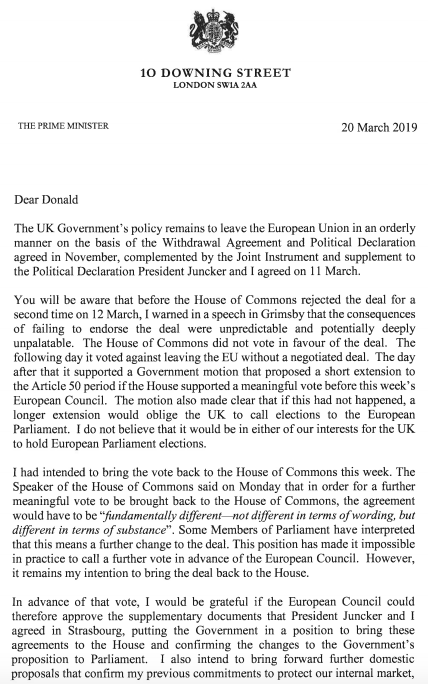 Her letter to European Council President Donald Tusk seeking the extension was bold and sets her up to clash again with Parliament, as she has promised another vote in the House of Commons should the EU endorse the legal assurances she secured earlier this month. But another vote on the deal without any substantial changes to it — a vote that the Speaker will surely not want to bring forward given his previous objections — sounds like a groundhog day for May. 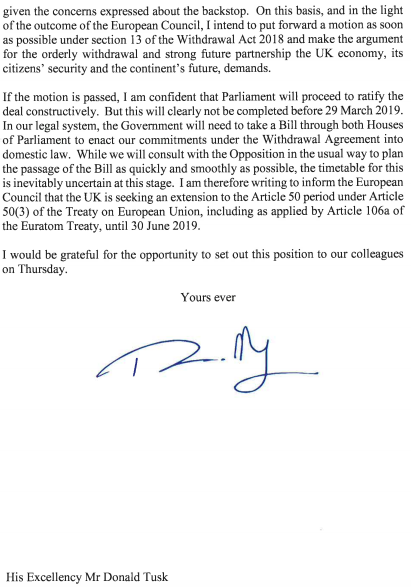 The letter comes less than 24 hours before the May flies to Brussels for a momentous European Council summit. It could be the last one before a hard Brexit or it could be one that forms a consensus for EU 27 Member States to agree on an extension. Any extension, short or long, will come with a political price for the UK in the negotiations. When she arrives in Brussels tomorrow, May will be doorstepped by journalists. Following formal discussions with Tusk and EU’s chief Brexit negotiator Michel Barnier, there will be a formal statement and a press conference. All of these moments are carefully choreographed and meticulously planned. Her communications team will check every word and turn of phrase in her speech as everything she says could shift the markets. She’ll want to project a calm, strong demeanor and articulate a clear plan for the road ahead to reassure businesses and citizens that there is a light at the end of the Brexit tunnel. No matter what she says and what happens next, the debate will continue to divide the country. Instead of letting the naysayers take control of the media story, May should blanket the airwaves and dailies with substantive interviews. She should also deploy surrogates to continue a steady amplification of coverage of her plan for the country. She should not limit her engagement just to domestic media in the UK. Brexit has global implications. Therefore, it will be equally important that both May and her surrogates speak with media in the U.S., EU and internationally. This will take time, but the time invested in ensuring effective, well-delivered communications will always pay dividends.